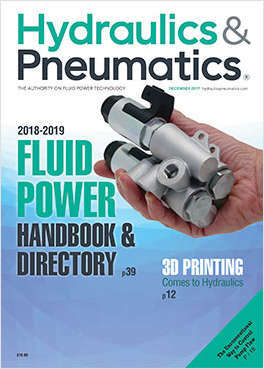 Free Subscription: "Hydraulics & Pneumatics"
Hydraulics & Pneumatics serves design engineers, manufacturing engineers, and other technical personnel who are involved in buying or specifying fluid power components, systems, materials, and controls. Do you wish to receive a FREE subscription to Hydraulics & Pneumatics? How would you like to receive your copy of Hydraulics & Pneumatics? Do you specify, select or otherwise influence the purchase of components for hydraulic or pneumatic systems on new or existing machinery or equipment? Which best describes your title? What is the primary Hydraulic product line? Would you like to receive FREE eNewsletters from Hydraulics & Pneumatics? Product Source (Varies): Features a wide range of fluid power and pneumatic power products, including samples and free offers. Fluid Power (Monthly): For Design Engineers that design with or specify fluid power and pneumatic power systems and components.